Microbes are important in many aspects of our lives. Some microbes cause disease while others provide metabolic capacity in human intestines. Microbes also participate in environmental nutrient cycles and provide many molecular tools for biomedical research. However, due to difficulties in cultivating pure species in lab conditions, much of the microbial diversity has not been characterized. Recent reduction in DNA sequencing cost gave rise to popularity in metagenomics, a method to investigate unknown microbial diversity by directly sequencing genomic DNA recovered from environmental samples. In this project, we developed a microfluidic-based mini-metagenomic approach that improves the identification of novel phylogenetic groups. This approach uses microfluidic parallelization to separate an environmental sample into many small sub-samples containing a few cells, significantly reducing complexity of each sub-sample and allowing high quality assembly while enabling higher throughput than typical single-cell methods. 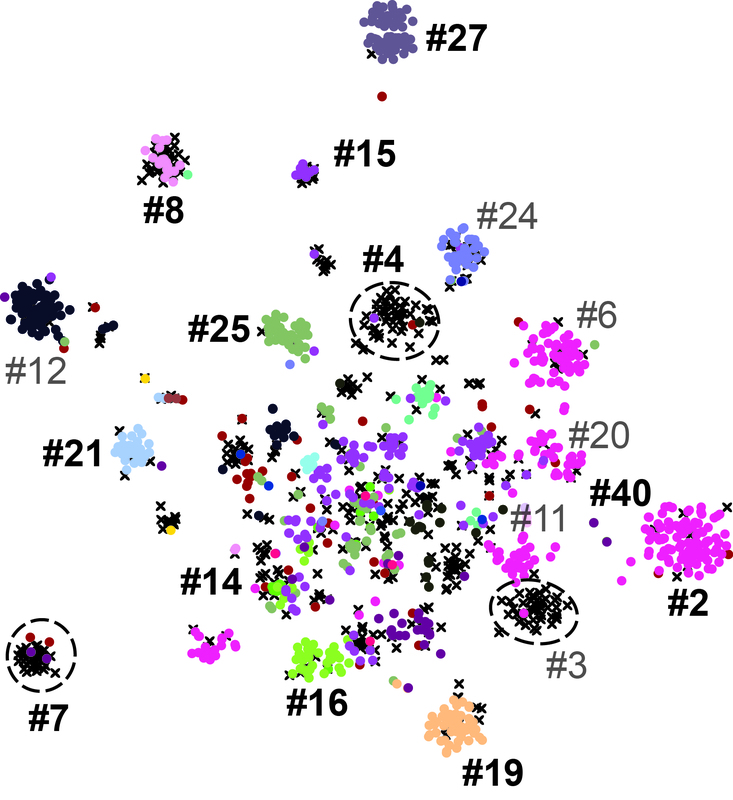 Although each sub-sample contains a limited mixture of several genomes, single-cell resolution is regained through correlations of genome co-occurrence across sub-samples, which in turn enables a rigorous statistical interpretation of confidence and genome association. As a result, the mini-metagenomic method combines advantages of current shotgun metagenomic and single-cell approaches. Our mini-metagenomic method is implemented on a commercially available Fluidigm© C1 microfluidic platform, which leverage the advantages of automated fluid handling. In addition, statistics derived from co-occurrence patterns enable statistical confidence in associating contigs (bioinformatically assembled DNA sequences) into genomes. Applying the method to two hot spring sample from Yellowstone National Park, we successfully revealed genomes belonging to multiple known and novel bacterial and archaeal lineages. Functional analysis revealed that these organisms utilize diverse pathways for energy metabolism. The resolution of the mini-metagenomic method enabled accurate quantification of genome abundance, even for rare genomes. Our analyses also revealed a wide range of genome level single nucleotide polymorphism (SNP) distributions. 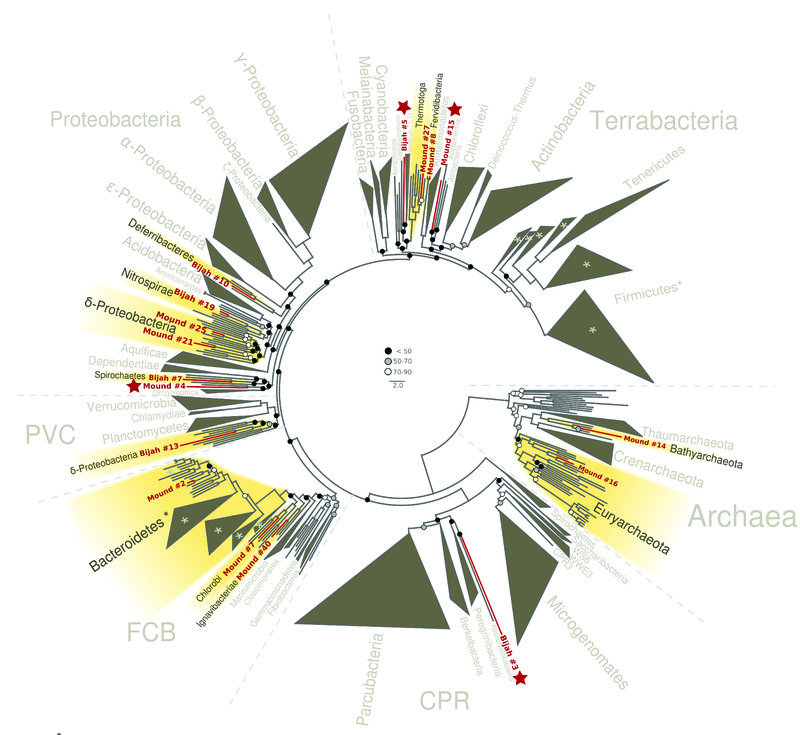 These results demonstrate the power of our microfluidic-based mini-metagenomic approach for discovering novel phylogenies. We foresee the method to be broadly applicable to answer questions related to environmental microbial communities. Cyanobacteria are important agents in global carbon and nitrogen cycling and hold great promise for biotechnological applications. Genetically tractable model organisms such as Synechocystis sp. and Synechococcus sp. have advanced our understanding of photosynthetic capacity and circadian behavior, mostly using population-level measurements in which the behavior of individuals and population heterogeneity cannot be monitored. Therefore, a single-cell level understanding of the phenotypic heterogeneity across populations and how environmental factors such as changes in light affect growth may provide insight into how cells integrate external stimuli with internal mechanisms of cell-cycle and cell-size regulation. This understanding may also be required for optimizing the efficiency of large-scale Synechocystis bioreactors. Tracking Synechocystis cells at the single-cell resolution is challenging due to their morphology and slow growth rate. To overcome this challenge, we modified a microfluidic cell-culture system and developed an image analysis pipeline to monitor Synechocystis growth and division over several generations in continuous illumination or with light-dark cycling. Using parameters extracted from single-cell growth curves, we saw that cells expand their volume exponentially. When exposed to light-dark cycles, growth and division only occurred during the light period. Although dark periods halt growth and division, they do not disrupt cell-cycle control. Finally, relationships between birth size, division size, and generation time are compared to simulation results to reveal the most consistent model of cell-cycle regulation. We believe that our microfluidic setup and image analysis pipeline can be used to explore phenotype of a much larger variety of bacterial species and answer questions related to bacterial adaptations to environmental changes. Because of its small reaction volume, high throughput capability, and amenability to automation, microfluidic technology has seen tremendous growth in biological, chemical, and medical fields. Multilayer, pressure driven, PDMS (polydimethylsiloxane) microfluidic devices, in particular, have been commercialized in many applications. Similar to an electronic transistor, the microfluidic valve developed in the Quake Lab acts as a switch directing fluid flow on-chip. This control component allows for large scale integration of hundreds of individual reaction components. However, as the complexity of microfluidic devices increase, yield decreases, especially for custom chips made in research labs. It is often difficult to identify defects in complex microfluidic chips by eye, leading to significantly longer design-build-test cycles. Borrowing concepts from electronic post-fabrication testing, we constructed a setup to perform automated post-fabrication testing of multilayer microfluidic devices. Collaborating with the Chakrabarty group from Duke University, we generated circuit models of microfluidic devices including functional effect of different design and fabrication errors. Using test patterns specifically designed to target functional defects, we demonstrated experimentally the applicability of using electronic post-fabrication algorithms to detect functional errors in microfluidic devices. We hope that the use of automated testing in the fabrication process will decrease the design-build-test cycles and lower the barrier of using microfluidic technologies. Multilayer microfluidics based on PDMS (polydimethylsiloxane) soft lithography have offered parallelism and integration for biological and chemical sciences, where reduction in reaction volume and consistency of controlled variables across experiments translate into reduced cost, increased quantity and quality of data. Even though microfluidics, using push up or push down valves, offer great power for precision measurement and analysis, they do have limitations. One such limitation is that the on-chip elastomeric valves can only act like digital switches, allowing or preventing flow. The same valve cannot provide a range of analog actuation pressures to partially restrict a channel without requiring the user to manually adjust bulky, external pressure sources. When it is necessary to vary pressure and flow rates of multiple flows on the same device, an on-chip method to create a range of pressures from a single, constant, external pressure source is preferred. In this project, we designed and fabricated a microfluidic serial DAC (Digital to Analog Converter) that can be integrated with any PDMS device to expand its functionality, effectively adding an on-chip pressure regulator. The microfluidic serial DAC can be used with any incompressible fluids and operates in a similar fashion as an electronic serial DAC. In this device, PDMS diaphragms act as fluidic capacitors to store pressure. Experimental results demonstrated linear transfer function with a 4 bit binary code, resulting in 16 distinct pressure levels. In addition, this component has a maximum refresh frequency of 3 Hz and can maintain pressure for up to 10 minutes. Therefore, the microfluidic serial DAC adds to the repertoire of versatile on-chip control elements. Parylene is a popular material used in implantable devices due to its flexibility and biocompatibility. In the MEMS lab at Caltech, parylene-based MEMS (microelectromechanical system) check valves are used in implantable and in vitro devices to regulate pressure and flow of liquids. The property differentiating various passive check valves is their cracking pressure, defined as the lowest pressure at which flow is permitted. In order to control cracking pressure of fabricated parylene check valves, we explored two separate approaches. Since materials differ in surface properties, coatings may change surface adhesion (stiction) with thin parylene films, resulting in different cracking pressures. To test this idea, we subjected silicon substrates to various treatments, metal coatings and found that by adjusting surface treatments, a large range of cracking pressures can be achieved. Another direction involved using gray scale photolithography to pattern slanted photoresist profiles. Parylene is then deposited on top of the photoresist as a thin film. After fabrication, thermal annealing is performed to increase tensile strength in the slanted parylene tethers. In this process, the time and temperature of the annealing process are tuned to achieve the most desirable cracking pressure.